When Hildy Stuart and her family are ousted from their rented home for the summer by their stuffy landladies, they rent an old vacation home on a lake that has deteriorated since its glory days to the point that the Stuarts decide to name it Ramshackle Roost. As though relocating to a tumbledown building isn't bad enough, to the great dismay of all the Stuart children, they will be joined on their vacation by Guy Hanley, an obnoxious know-it-all sort of child whom they would always prefer to avoid if at all possible. As the summer passes, there are definitely some difficulties, but all of the Stuarts find ways to enjoy themselves, and near the end of their stay, they even have a chance to solve a local mystery. This was a lighthearted and quick read which felt very contemporary, despite being written in the 1970s and set in the 1920s. There are details which date the book to the time period - the need for ice to be delivered to use in the ice box, the style of clothing the children wear, and the lack of electronic devices - but there is just as much about the kids' experiences that could come from any time period. As I read, I was reminded of three books from different decades that were similar in style and content to this one: Swallows and Amazons by Arthur Ransome, Ten Kids No Pets by Ann M. Martin and The Penderwicks by Jeanne Birdsall. All of these books share a "free-range" attitude toward parenting, where kids are free to roam and create their own fun with minimal involvement from adults. When the kids do occasionally run into difficulties, they resolve them using their own ingenuity and intelligence. 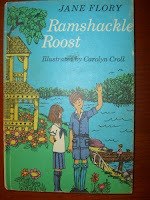 Ramshackle Roost is not the best-written of books in the "adventures in your own backyard" subgenre, but it embodies values I appreciate, and it promotes an overall positive worldview, where kids are encouraged to make the best of difficult situations and to work out their differences together. I enjoyed the book very much as an adult, and I know I would have liked it even more if I were ten years old. I only have two complaints. One is that the cartoonish illustrations didn't match the text. They might have worked well for a 1970s novel about the 1970s, but they are not really suited for an historical novel set in the 1920s. The other is that the mystery part of the story, which is the most compelling piece of the entire plot, starts way too late. There are some allusions to thefts around the area throughout earlier parts of the book, but to have this suspenseful storyline begin with less than a quarter of the book remaining makes it feel like a rushed afterthought even though it is a truly compelling mystery. The characters carry the rest of the story well enough, but it would have been nice to have this plot as a strong continuous thread that stretched all the way from the beginning of the book to the end.